Pruning your trees doesn’t just improve the look of a tree. It keeps passersby and your property safe. Here on the Front Range, trees are often damaged by high winds, lightning, heavy snowfall (especially in the spring months), and a litany of other sources. When your branches aren’t thriving, they can be downright dangerous. Fortunately, we provide safety pruning services to ensure that your property is safe from the hazards of dead and dying tree limbs. So let’s talk branch safety. When Is a Branch Unsafe? Your branch isn’t producing leaves in the warmer seasons. The leaves of your tree are discolored. The branch is overgrown with moss or mildew. The branch is cracked or broken. The branch is missing sections of its bark. The branch is visibly damaged from insects or animals. If you notice any of these signs, have an arborist over to see if the limb can be saved, or if it should be cut. Branches are constantly exposed to mother nature. High winds can snap branches. Lightning can split branches. Heavy snow can cause branches to collapse. Frost snaps can shock and kill branches. Termites can ravage branches. Your branches may also die if the roots of your tree aren’t getting enough nutrition or water. At the end of the day, branches are built to withstand all of the elements that mother nature can impose. However, in the most extreme conditions, branches do fail and fall. Don’t let a dead limb damage your home or injure a bystander, give us a call! If you notice any signs that your branches may be weakened, its best to have an arborist over to your property for an inspection. We can advise you as to whether or not you’ll need to remove your branch or if it may have a chance at recovery. Here at Lumber Jack & Jill, we have a highly qualified, skilled, and educated team of tree care experts. 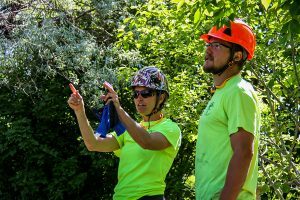 Our International Society of Arboriculture certified arborist is qualified to assess the safety of your trees. Count on our arborists to assess the health of your trees and to prune them safely. If you’re ready to get started, get in touch for a get a free quote!